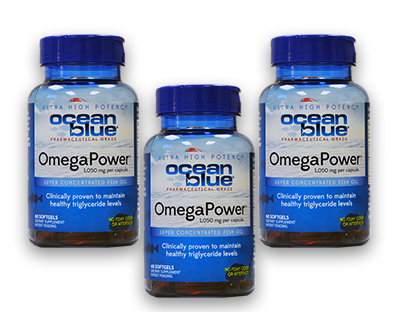 Ocean blue® OmegaPower™ is a super concentrated, pharmaceutical grade fish oil containing 1,050 mg of the most scientifically studied Omega-3 components (EPA and DHA) in just one capsule. It contains 3 times more Omega-3 than regular fish oil and is clinically proven to maintain healthy triglyceride levels. Ocean blue® OmegaPower™ has a soothing, natural vanilla flavor, so there isn’t any fishy odor or aftertaste.